My quilt guild (Dalemead Quilt Guild) is having a quilt show this October. 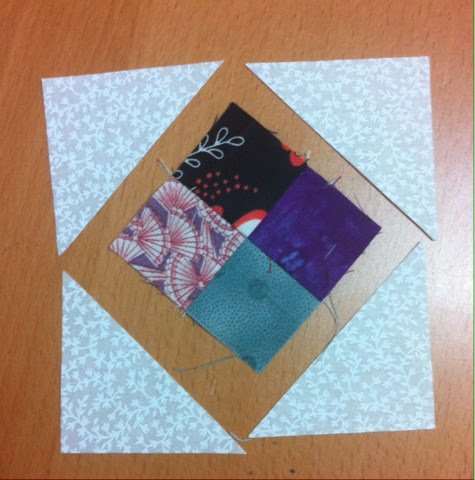 Part of that show is going to be a display and auction of mini quilts made by our members. Last week, we had a work bee to get started. 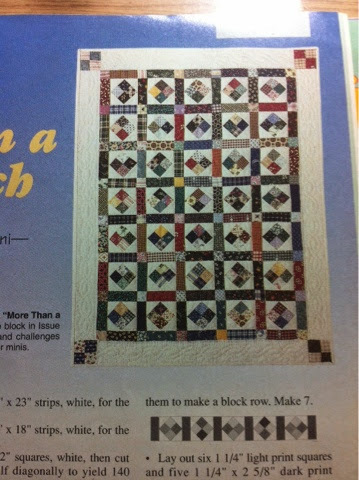 I picked this pattern from Issue #45 of Miniature Quilts from 1999. 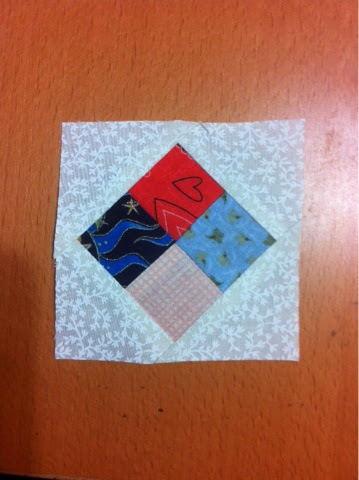 The pattern called for 1.25" scrap squares, but I decided to use the 1.5" squares I've already cut and collected. 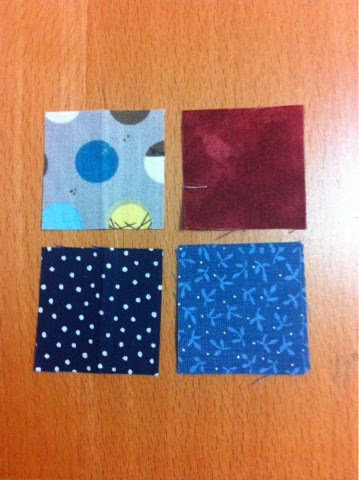 I randomly picked squares and sewed them together into 4-patch blocks. Then I cut 2x 2 3/8" cream colored squares and cut them once diagonally. 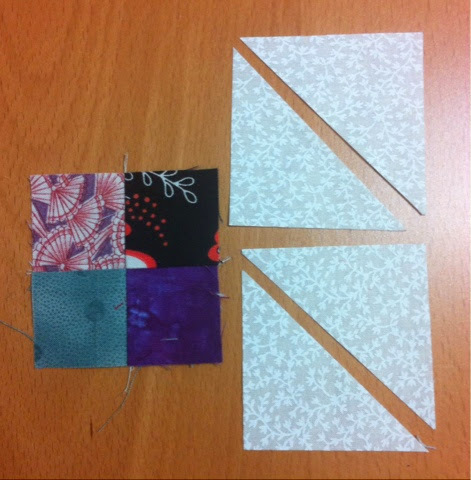 These triangles were sewn to the sides of the 4-patch making a square in a square block. I find these blocks tend to stretch a bit so I will square them up before I use them in a quilt top. These should be 3.5" unfinished, but my seams are not always a scant 1/4" and often they end up just a bit smaller. I need 35 of these blocks, so I am going to cut all the cream squares I need and sew them in between the other projects I have on the go. Recently, I received some great fabrics from a customer for some baby quilts. There was enough fabric to make much more than the 5 baby quilts she wanted, including the batting and the thread! I felt extremely spoiled to have more than enough of everything to make the quilts she wanted and the best part is that I loved the fabrics she had chosen! The pattern chosen was from the Holly and Olive blog - Modern Strip Quilt. 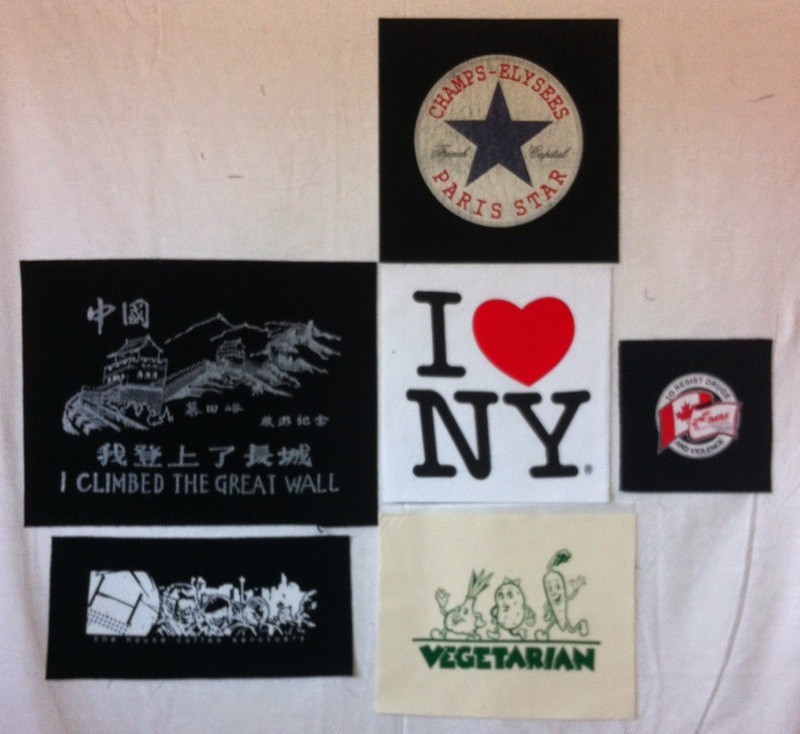 This is a super pattern to show off some of the larger print fabrics that are out there for baby quilts. I varied the width of the strips and cut them from the full width of fabric, so these baby quilts are a little wider than my other baby quilts. There are still 2 quilts left to finish and I think I'm saving the best for last - they feature sock monkeys and are bright and colorful! This will probably be a pattern I return to for quilts to stock at Magpie Quilts as I really enjoyed making them! Last week, I put the pedal to the floor on my sewing machine and finished up some baby quilts. I managed to finish 3 baby quilt tops with 9-patch blocks, in blue, pink and purple. The blue and pink ones are completely finished and the purple one is waiting for some batting so I can quilt it! The 4th one is a custom quilt that I made for a customer in neutrals. 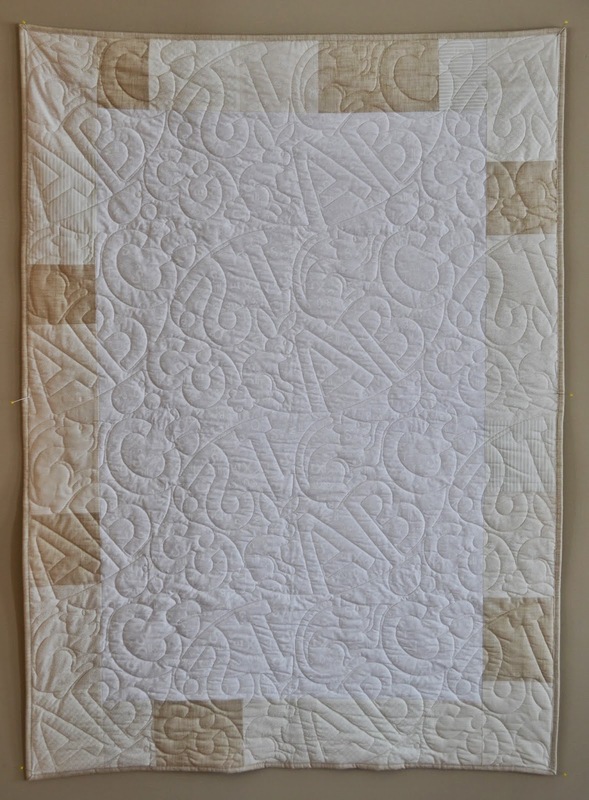 I normally quilt the baby quilts myself on my home sewing machine, but this one had so much open space, I opted to have it quilted by Marie from Blueberry Hill Quilts in Chestermere, Alberta (she does all my large quilts!) and love how it turned out. Low Volume Baby Quilt - SOLD! I have one more baby quilt that's in progress and you will have to wait to see it! I normally don't get into political topics here on my blog - but I've been reading a bit about the low wages paid at Walmart (and probably other discount retailers) and it has me concerned. We are so used to looking for low prices, that sometimes we forget that real people work for the companies we shop at - either locally at the retail level or international at the manufacturing level. I do think businesses have not only a responsibility to their shareholders, but also to the communities their businesses impact. What does that mean to me? A small (extremely small!) entrepreneur who makes a small line of products at home and attempts to sell them online and in person locally? Many consumers have become so accustomed to low prices (made on the backs of workers who are not making a living wage - defined here in Wikipedia) that they don't understand the costs that go into a handmade product. I belong to a group of online quilt sellers and a common complaint is the consistent requests that we sell our products for less than our asking price. the expertise of that quilter - the skills and techniques they have learned and their ability to turn design and fabric into a product that is beautiful and useful. the quilter's equipment - sewing machine, needles, pins, scissors, etc. As a consumer, it is YOUR responsibility to do your homework! I'm not saying don't shop at Walmart, but let them (and your politicians!) that it is not ok to do business and expect the taxpayers to pick up the slack when your employees are not paid a "living wage". When you buy from an artisan or local crafter, realize that most are not making millions doing what they love, just using what they love to pay some bills. Ask them about what goes into their product - they will love to tell you. And maybe, you will love their stories so much you will buy their product for what they are asking! Friday was road trip day for me and one of my quilting friends. 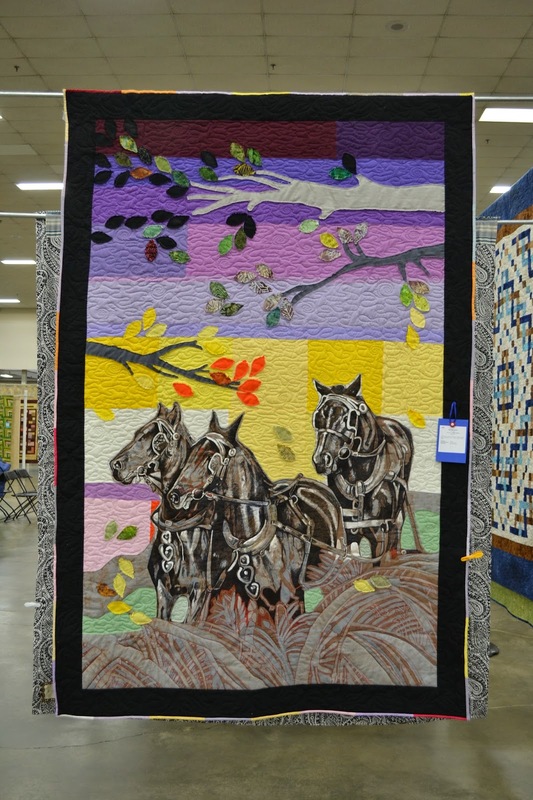 The Central Alberta Quilt Show is always a great event, well-organized with plenty of quilts for eye candy and a great selection of vendors to clear the wallet of any loose change! Here's a few examples of the eye candy! This quilt caught my eye as the rural lifestyle has always been a large part of my life, throughout my childhood and my adult life. These draft horses remind me of the team of Percherons that my father-in-law had towards the end of his life and the stories he told of when he was young, farming with the horses. I have signed up on Craftsy.com for the Gloria Loughman class to make this landscape quilt. 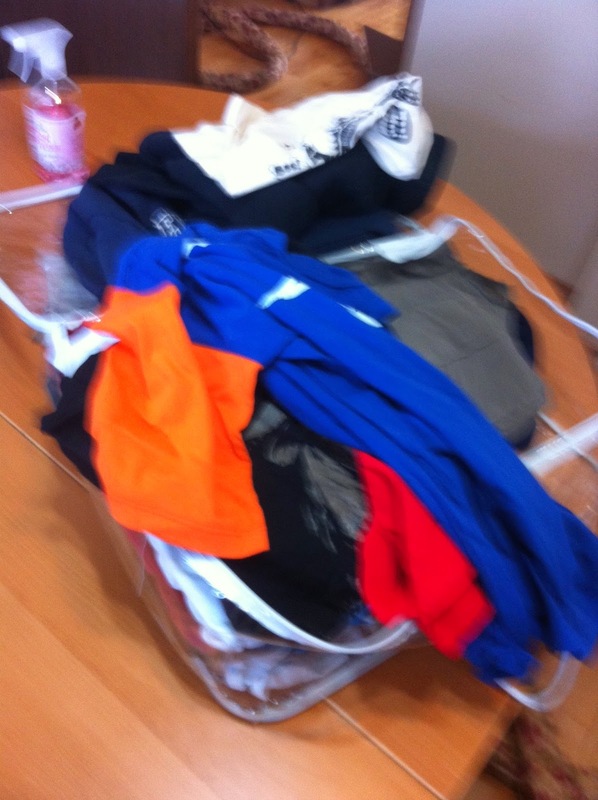 My friend has made this one too and if I can snag a pic next time I'm at her house, I'll show you hers too. 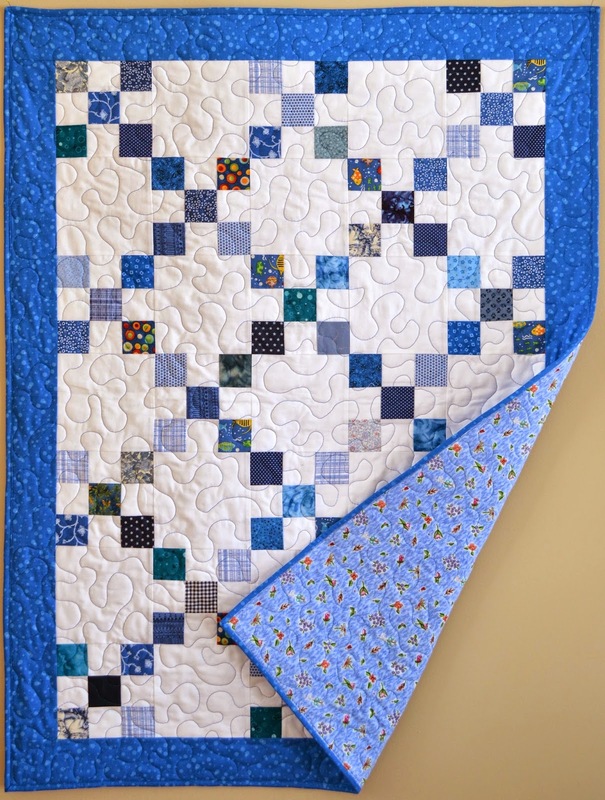 I love the way the piecing provides the perspective and Gloria Loughman is a great teacher - this online class is worth every penny as you not only get to make this quilt, but there are tons of other tidbits of knowledge there too. 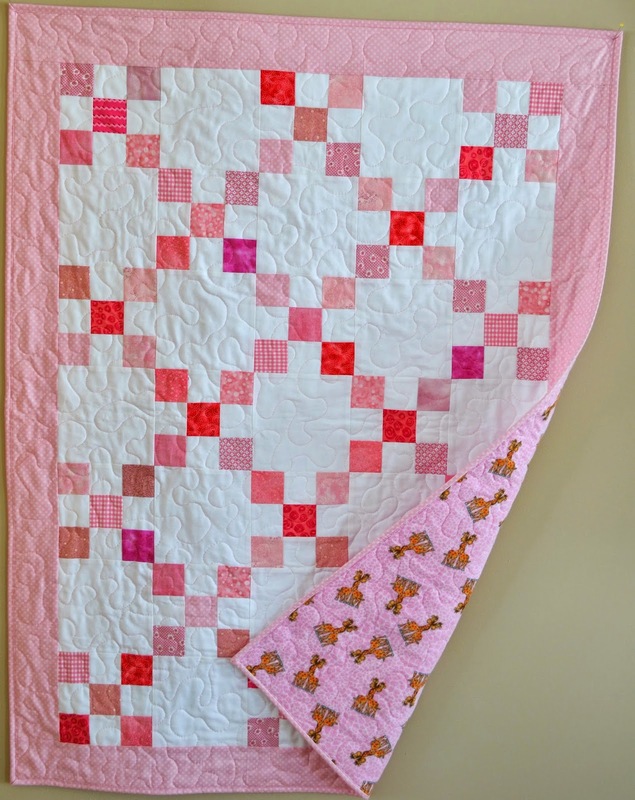 I love quilts that combine traditional piecing with handwork of any kind. 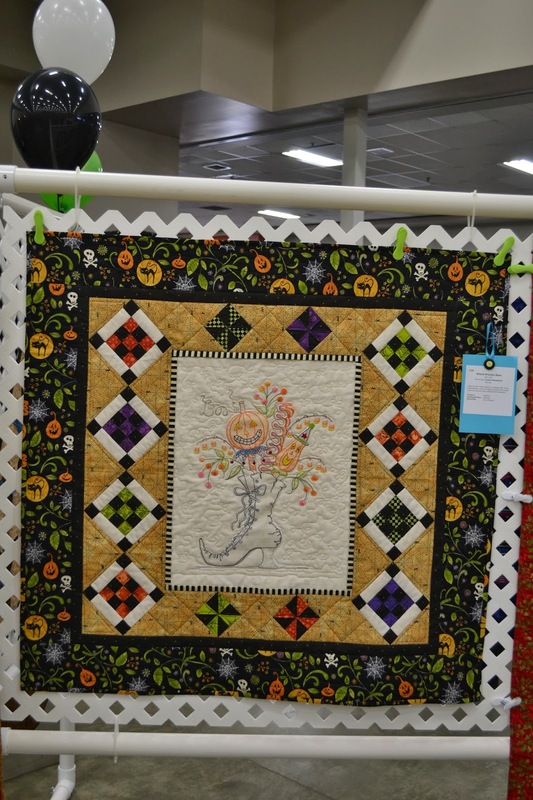 Usually this means applique, but here's a great example of a lovely Halloween themed embroidered piece framed by quilting. I'm not a huge fan of the bright oranges that usually accompany Halloween pieces, but this one could find a spot in almost any decor and not scream "Halloween". And this was just a simple patchwork quilt with some sweet embroidery and yo-yo flowers to dress it up. This would look great on a little over the shoulder bag don't you think? There were many more quilts, but also people to visit with as I met up with quilting friends from all over Alberta who were also there to look and shop! 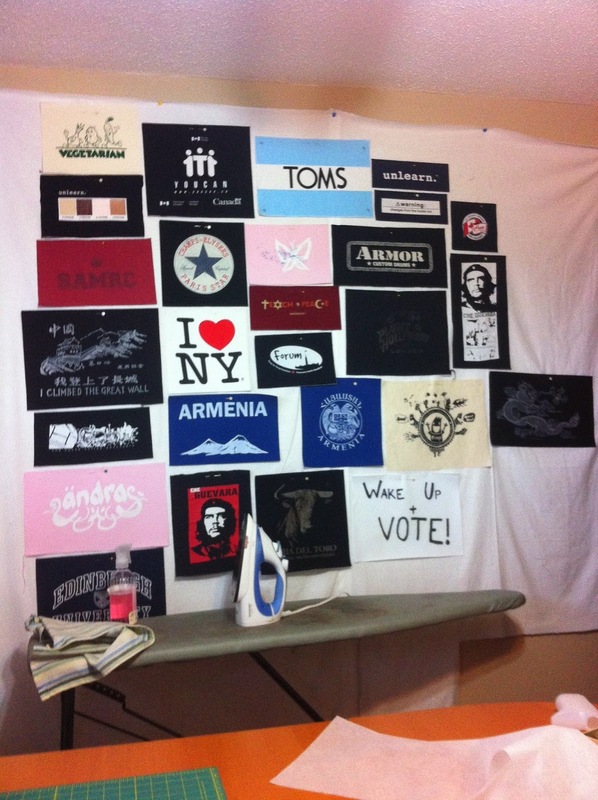 What's the best quilt show you've been to? Do you spend more time browsing the quilts or shopping at the vendors?